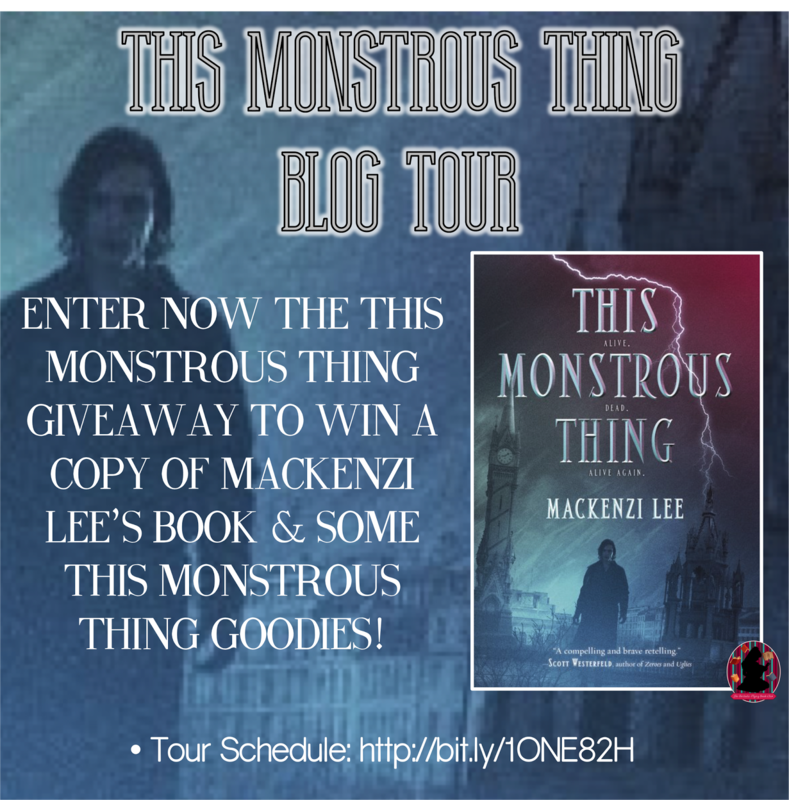 Two Chicks On Books: Blog Tour- THIS MONSTROUS THING by Mackenzi Lee a Guest Post and a Giveaway! 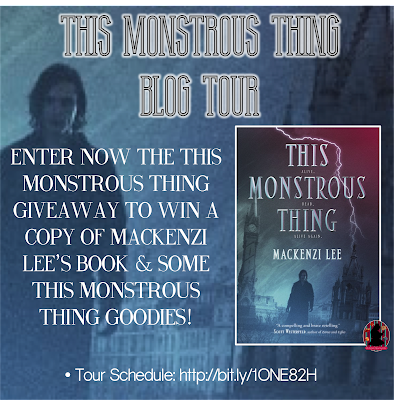 Blog Tour- THIS MONSTROUS THING by Mackenzi Lee a Guest Post and a Giveaway! 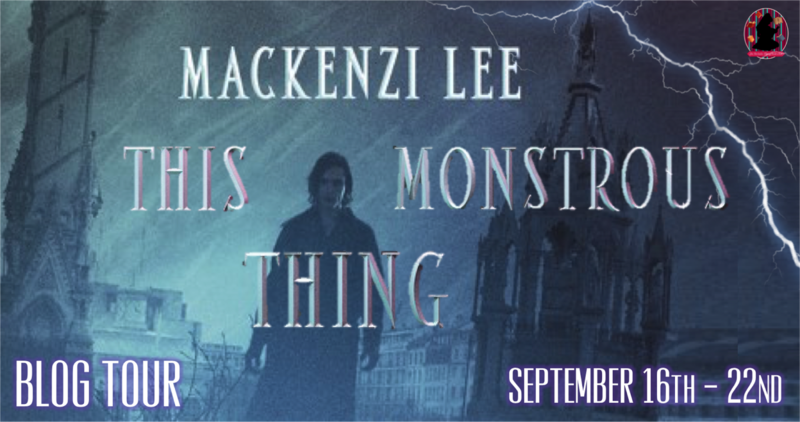 This is not a deleted scene or a rewritten scene, per say, so much as it is a missing scene from the book. And also from someone else’s point of view. 1. This scene takes place after chapter 13 of This Monstrous Thing. Which is about halfway through the book. So mild spoilers. Obvs. 2. This scene is written from Oliver’s point of view. Don’t get confused. I have not been outside since I died. If there were not men who’d like to see me die again chasing us, perhaps I would be enjoying the reunion a bit more. We don’t have to run far to lose them. The snow has frozen and crusted over with a thin, icy layer since the blizzard, and breaking it takes a heavy step. The officers tire fast. I hear them fall behind, their shouts tapering into faint trills like birdcalls. Then they fade entirely. We keep running, even after they quiet, down the slope of the foothills and toward the faint glow, down through the pines toward the lakeshore. It’s not me who stops—it’s the girl, this mechanical wonder of a girl whose name I still don’t know. She collapses backward very suddenly against the base of a black tree, one hand pressed to her chest. A metallic wheezing sound threads its fingers with her breathing, so the hissing sound that leaves her is part human, part machine. I stop too and stand over her, waiting. My own breath meets the air in a thick white cloud. I’m not wheezing or leaking. I am better made than she. I can feel the burn of the cold in the flesh and bone parts of me, like borderlines drawn upon maps, lines that separate the human parts of me from those that are less than. In that moment, I am feeling made mostly of the less than. I did just kill a man, after all. Perhaps two—I didn’t hang about long enough to see. 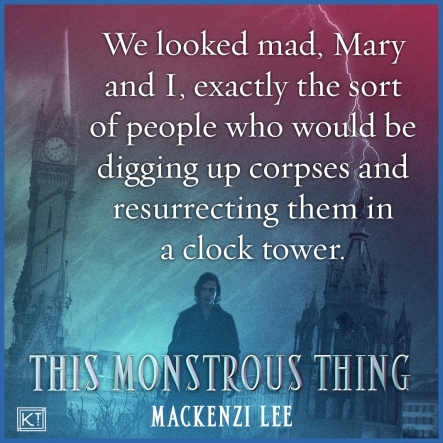 I am not sure if that makes me more human or monstrous. I look down. The girl has caught her breath and is looking up at me now. 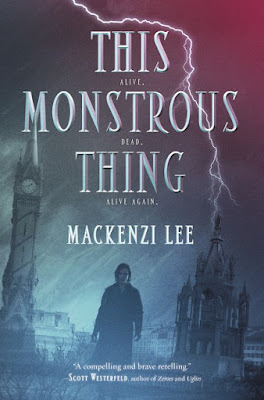 She’s a small, spindly creature, and that daft, several-sizes-to-big coat makes her look more so. Her white hair is a spill of moonlight through the darkness. She picks up a handful of snow and presses it against her cheek with a mumbled curse. I watch her for a moment, then scoop a fistful up with my mechanical fingers, just as she did. It sits, sludgy and unchanging in the frozen metal, and I transfer it to my flesh-and-blood hand. It’s so cold it burns, but after a few seconds, begins to melt and thin tracks drizzle down my arm. My fingers start to throb, but I don’t let go. That we is an arresting word. I have not been part of a we in a long time— whatever Ally and I have been for the past two years, it’s certainly not a we—and it tugs at my insides like a hook. I slide down into the snow beside her, all my joints squeaking in their frozen, metallic glory. I wince without meaning to. Sometimes I am still caught off guard by my own repulsive body. We sit in silence for a while, because I don’t know what to say to her. I have not been required to make polite conversation in all of my little life and after several excruciating moments, it’s clear that’s not a skill that’s going to return easily. Or perhaps there simply is no appropriate small talk to be made after a murder and a flight. “Your hair is rather arresting,” I say at last. “Because of Geisler?” I ask. She lets the slushy remains of her handful of snow fall back to the ground, then slides one hand to her breastbone, a two-fingered touch under her coat, like she is pressing something into place. I am trying not to stare at her chest, because we’ve only known each other for what equates to maybe an hour at best, but it’s hard not to when I can see that gleam of metal poking out beneath the collar. “May I see it?” I ask. She laughs as she unfastens the buttons of her coat so that the neck falls open, then pulls up her shirt with a shiver so I can see the silver paneling beneath. She fits her fingers into the seam, same way Ally’s done for me dozens of times, and swings it open. And we are almost the same, she and I, like two garments cut from the same cloth. Bellows and cogs in place of lungs, bolts and pins holding them in place. A body that could not function without the foreign, metal parts assisting it. 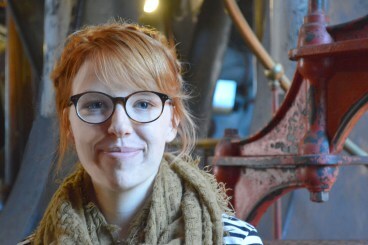 She is Geisler’s thing, same as I am Alasdair’s. I reach out a single finger of my mechanical hand and run it softly along the bolts that line her lungs. “Easy on the goods there, darling,” she says quietly, a thin smile teasing her lips, though I have a sense it’s only there to conceal the pain. I drop my hand. 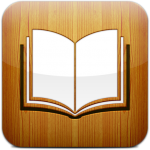 She knocks the panel closed with a knuckle and does up the buttons of her coat again, her head tipped backward against the pine tree. “Were you ever dead?” I ask her. “I’ve never met…anyone,” I say. Her eyebrows crease. I think for a moment she is looking at me with that same sick pity Ally wears, but when the moonlight falls on her face, it isn’t pity. It’s something else entirely, something unfamiliar and fragile. Then she reaches out and very softly touches the tip of one finger to a scar near my ear so that her palm rests upon my cheek. 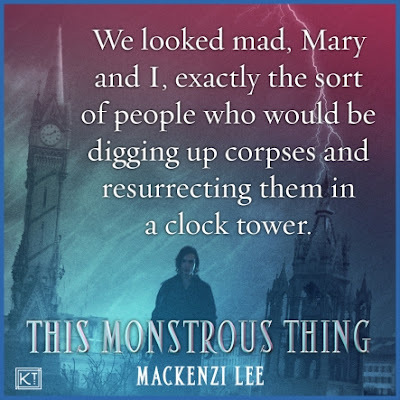 “We are beautiful monsters, aren’t we?” she says. A soft dollop of snow falls from one of the branches and splays upon the ground beside us. The wind ruffles the pines. An owl flies across the moon. The stars are very, very bright, handfuls of salt across a velvet sky. She keeps her hand there, upon my cheek, and for a time, we breathe together. Man-made, mechanical things. 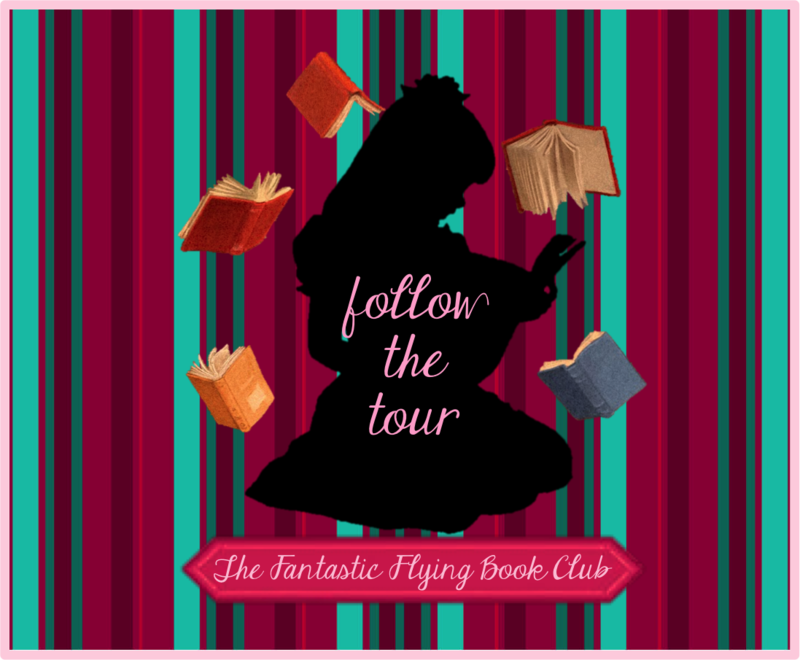 This book is perfect for my daughter to read--she loves the suspense and thriller novels. The cover alone would make me take it off the shelf. I am very intrigued by this book. A very interesting premise. 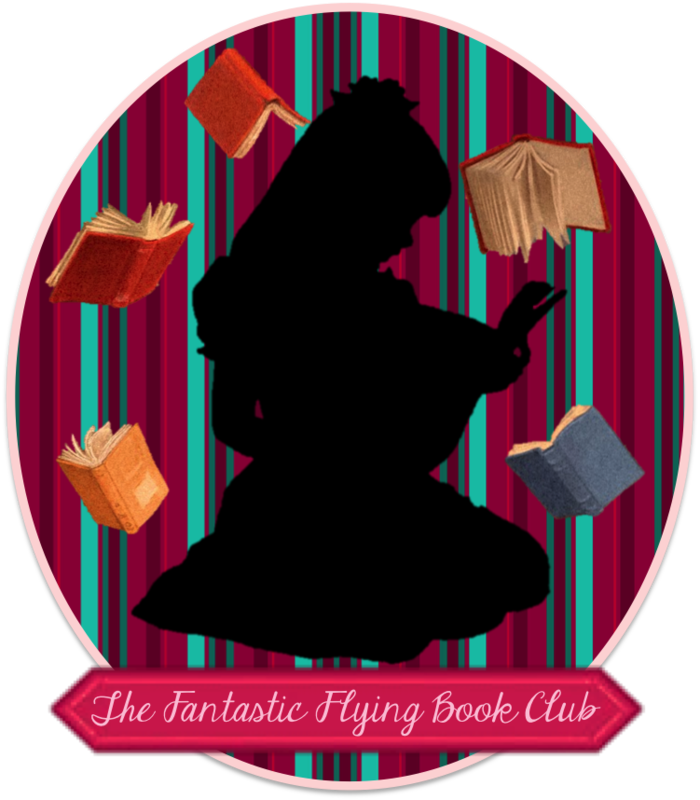 I would love to read it! Thanks for the giveaway.